... in a gorgeous southern Indiana town named Madison which still sits (amazingly preserved too) on the banks of the Ohio River. William's father John F built a successful import business in Madison, Evansville and Brooklyn NY which made them able to build this gorgeous mansion in Madison. The house is mentioned several times during the trial of Copeland in 1895. Above in the right of the picture: The Bruning carriage house has been moved across the street and still remains intact in Madison. It is listed on the National Register of Historical Buildings. Springdale Cemetery has several ghost legends. 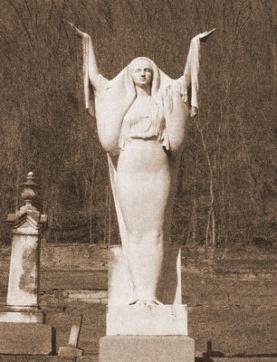 Above Right: Springdale Cemetery George Gray Barnard Angel which overlooks the Bruning monument left. Angel is rumored to cry blood on Easter morning and chase those who kiss her feet. Photo from the archives of the Jefferson County Historical Society. Above Left: Bruning Family Monument surrounded by individual headstones. Grandmother Von Broke Zur Lage, Mother Catherine and Father John, older sister Caroline and wife Ellen (Nelle) have headstones here. William is buried but without engraving or headstone or marker of any kind. Above: The Broadway Fountain was originally cast in bronze and exhibited at the Centennial Exhibition in Philadelphia in 1876. 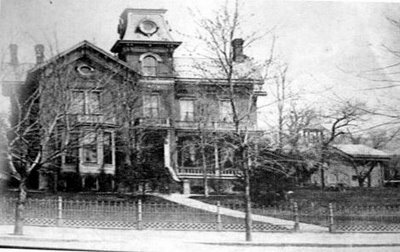 It was then purchased by a Madison Lodge and transported to Madison Indiana in 1886, the year after the Copelands were married and moved into the cupid half of John and Catherine Bruning's mansion seen above. The Brunings would have passed the fountain every time they went downtown to their mercantile. The fountain was restored in 1976 and still stands today. Above: Downtown Madison circa 1870. 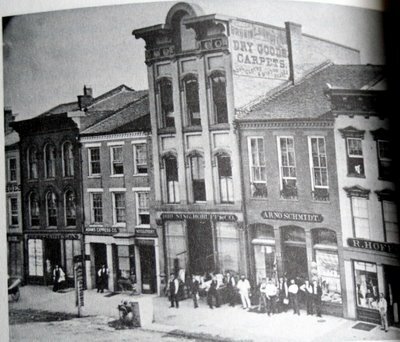 In the middle is the Bruning and Horuff Dry Goods Store. 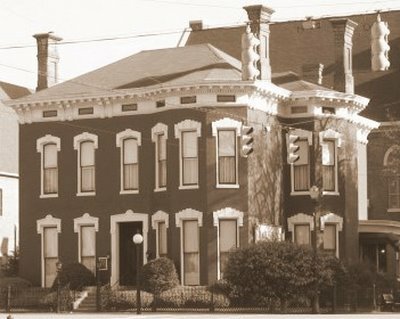 This picture is courtesy of Historic Madison Inc and was originally published in the book The Early Architecture of Madison Indiana by John T. Windle and Robert M Tayor Jr. Above: Vail Funeral Home in Madison where the Bruning funerals were held. Where might Bruning have taken a drink? 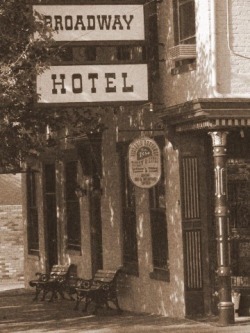 Left: The Broadway Hotel has been a mainstay in Madison since 1834. Steamboat captains, local businesmen, and even congressmen would have stopped to have a drink or get the weather here. To visit the Madison Jefferson Library's special River to Rail project which contains a wealth of pictures and information, click here.